It blows my mind how quickly people turn from “How cute is your baby?” to “It’s about time to make another one!” which can feel like someone stabs you in the heart. But, personally, I don’t mind straighforwardness, instead I welcome it because I have started to get more and more open with myself and others and this has given me a sense of freedom and calmness that I never had before. Sharing has been the reason that I kept going when our second’s baby tiny heart stopped beating at 9 weeks gestation because by sharing I was keeping his/her memory alive and that was exactly what I needed. But it has grown to be something more because when I first shared about it as a caption to a photo I uploaded on my Instagram, I received so many messages from women who had to go through the same thing and they were keeping it a secret because of a number of reasons but they felt that it was ok to share it with me because I also shared it with them. So this is my story. And I hope you can find some sort of comfort by reading it because if you read this, you probably go through something similar. To take things from the beginning, my husband and I have been together for almost a decade now and our love is unquestionable. We were married in June 2015, we went to our honeymoon in July-August 2015 and in October 2015 we decided to start trying for a baby, we were both ready and we wanted it so much! We were ecstatic to find out that we got pregnant the first time we tried and we were more ecstatic at 12-weeks to find out that our baby was healthy because both of us are carriers of the beta thalasseamia gene which means that we have 1/4 chance that our baby will have beta-thalasseamia. I had a smooth pregnancy even though I was working long hours and was stressing myself out. Getting pregnant was easy for me and the pregnancy was easy too! The only difficulty was when was my water broke at 39 weeks and I had to have an emergency c section which was really hard for me at first but I recovered beautifully and then, in October 2017, we decided to start trying again. Getting pregnant the first time was easy for me yes, but not the second time around. I know my body and I know when I ovulate, I can feel all the symptoms. Yet, every single month, my period was coming. After 7 months of trying, I decided to visit my gynecologist even though everyone says to wait one year before asking for help but given that my husband and I have that 1/4 chance of our baby having beta thalassemia and all the complications that come with it, I did not want to wait. I had a screening and some blood tests to see the levels of my hormones but everything was normal so her recommendation was just to keep trying and not stress about it. I know that stress is also a factor but by that time, I had quit my stressful job and decided to become a stay at home mom until I manage to find a balance between motherhood and career. Eventually, after 9 months of trying, my period did not come! Needless to say, we were both thrilled because we would finally give to our beloved son a sibling! I went to my gynaecologist at 5 weeks and she confirmed the pregnancy, at 6 weeks 2 days we heard the heartbeat and everything was going smoothly! One night, I had very light bleeding but I was not worried because it was very very very light and it was gone after 2 wipes. It is afterall very common. Everything was going great with my pregnancy, I only had mild pregnancy symptoms, fatigue mostly but nothing else. I was able to do everything with my toddler just like before, I was just careful to not pick him up because he was 14kg and I did not want to have any complications caused by picking up so much weight so early in the pregnancy. And then, at 9 weeks 2 days I had another routine appointment with my gynaicologist. Everything was fine until she told me there was no heartbeat. No bleeding no cramps no anything miscarriage related. Just no heartbeat. Something about abnormal chromosomes, bad shaped embryo, dead for 2-3 days, not my fault. Really, I couldn’t hear anything after not hearing the heartbeat. I cried the whole drive home. The next day I had a D&C procedure performed. I was crying before the general anesthesia and right after waking up from it. After a few hours I left the hospital with an empty uterus. I went home to our son and started healing both physically and emotionally but I knew I was forever changed. There are so many women that suffer a miscarriage yet it is such a stigma to share it for some reason and most of them suffer in silence, especially those who haven’t been able to have any children yet. But I have the need to publicly share my miscarriage and my pain because it is the only way to publicly acknowledge the existence of our beloved unborn baby who will always be a part of our family and our hearts and grieve its unbearable loss. When someone asks me if our son is our first child I answer yes. If someone asks me if he is our only child I respond with we had a miscarriage and we lost our second baby at 9 weeks pregnant. Because this is a fact. This is our truth. Both are our babies. Our babies. We will try again. As I write this article, I am calm. I am ok. 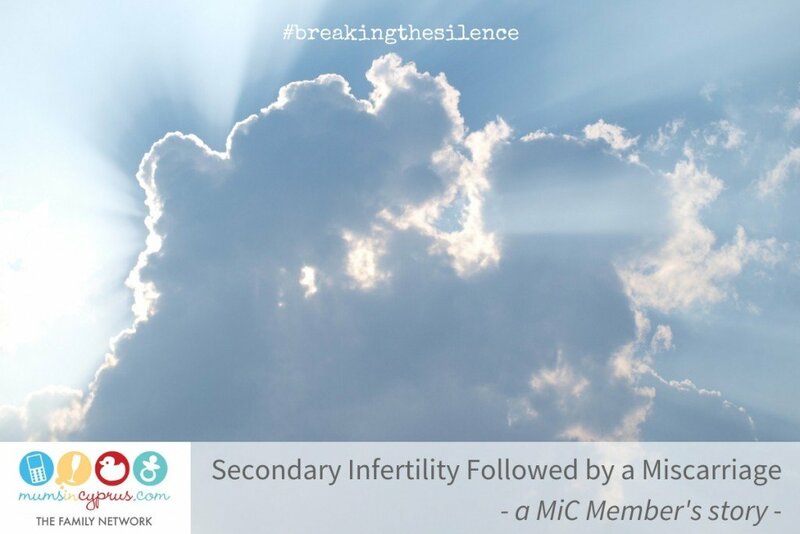 I know that 1 in 4 pregnancies results in a miscarriage. It can be scary but this is nature. There are days that I still cry. But I remember him/her every day and I do not cry every day. In Cyprus, at 40 days after birth, the mother and the newborn go to the church so that the priest can read blessings to them. I did not know until my grandmother told me a few days before my 40-day after miscarriage period that the mother still goes to the church 40 days after miscarriage. Needless to say I was devastated even though I am religious. How can I go to the church for blessings without a child? Without my baby in my arms? But I reluctantly went. I was crying like that first day that I learnt that there was no more a heartbeat. I struggled telling the priest what I wanted and he had to ask me twice because he could not understand what I was saying with my crying voice. And then he started reading me the blessing. By the end, I was able to breathe again and even smile. It was so comforting and cathartic for me. In a world that keeps spinning no matter what you are going through, never stop seeking what truly works for your. For me, it is sharing and trusting in God’s plan. Loving truly and deeply. Forgiving (this I still have to work on!). Never letting go but also keep going. Life is a gift and it must be enjoyed! If you lost a baby, it is ok to grieve for as long as you want. If you struggling with getting pregnant, it is ok to be frustrated. But at the same time, find the strength to live with it. Because if I learnt anything from my experience is that life is worth living! You can find out more about Anthi here.